On June 5, the planet Venus will appear to pass in front of the Sun as seen from the surface of the Earth. This phenomenon, called a transit of Venus, happens only a few times in 250 years. The next one will be in 2117 AD. Here's a guide to watching the once-in-a-lifetime event. But why does it matter? Transits of Venus were scientific gold for early astronomers, who used them to derive an accurate measurement of the size of the solar system. By noting the time each planet took to go around the sun, and then crunching that data via methods developed by 17th century mathematician Johannes Kepler, these telescope-equipped boffins could determine each planet's relative distance from the sun, as measured in terms of astronomical units (the distance from the Earth to the Sun). Collecting such data during a transit was the reason Captain Cook was able to travel halfway around the world from London to Tahiti in 1769. 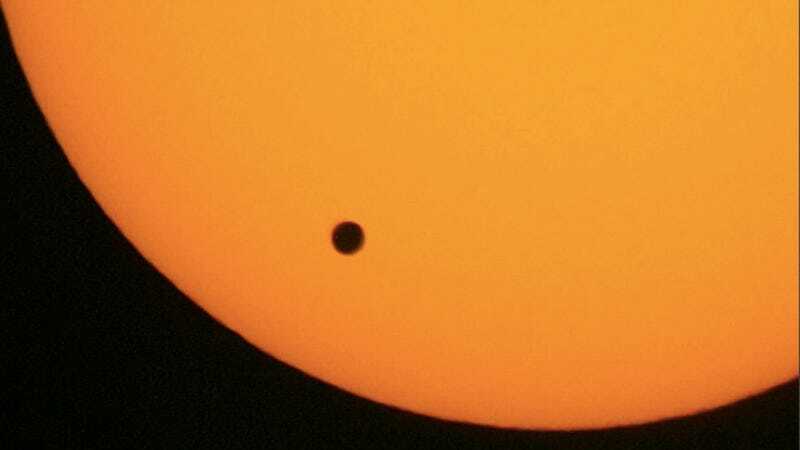 For 2012, a Dutch astronomer named Steven van Roode has created an smartphone app, VenusTransit, that lets users simultaneously observe the transit on different sides of the world. To use the app, you tap the screen the exact moment Venus completely enters the face of the Sun (Contact II, as it's called). The app notes the observer's precise location on Earth. Then, it collects the data necessary to make the most accurate ground-based measurement of the size of the solar system, while the transit is still happening! But wait, don't we already know the distance to the sun? Yes. Equipment in space provides us with very accurate direct measurements of the size of the solar system. Van Roode's project is more a cool example of citizen science, of people coming together around the globe to collect scientific data. Why doesn't a transit of Venus happen every year? The Sun is in the middle of the solar system. Then comes Mercury, then Venus, then Earth, then the rest of the planets (which don't enter into this, so forget them. Forget Mercury, while you're at it.) Focus on the Sun, Venus, and the Earth. We're used to thinking of the solar system as a number line, with all the planets lined up from left to right along the X axis. But that's not the case. Venus and the Earth go around the Sun at different speeds, in nearly circular orbits—a year on Venus is over before 2/3 of an Earth year is complete. This means that at any given moment, Venus could be behind the Sun, or to the side of the Sun, or on the same side of the Sun as seen from the Earth. The Sun, Venus and Earth only line up like a string of beads every 584 days or so. So why doesn't a transit of Venus happen every 584 days? Because the orbit of Venus is tilted about 3.25 degrees compared to the Earth's. This means that when the Sun, Venus, and Earth line up, Venus could be as much as 3.25 degrees above the Sun or 3.25 degrees below the Sun, or anywhere in between. Since the Sun is only about 1/2-degree wide in our sky, Venus could be in a region 15 solar diameters wide! It's not hard to see why only very rarely—like hundreds of years rarely—Venus would happen to pass directly in front of the sun, like it will a few hours from now.